LOCAL mental health partners have secured more than �3m to develop specialist community services for pregnant women and expectant mothers across the region. More than �3.3m has been awarded to the Cheshire and Merseyside Sustainability and Transformation Plan (STP) to develop local community perinatal mental health services. The money will be used to develop a Specialist Perinatal Community Mental Health Service which will be delivered through three locality teams across the region. The 'local' teams, provided by Cheshire and Wirral Partnership, Mersey Care and 5 Boroughs Partnership NHS Foundation Trusts, will support women with serious mental health problems during pregnancy and in the 1st year after birth. They will greatly improve access to evidence based treatments, as well as training for other frontline services caring for local women, to ensure consistent, high quality care across the region. Women are more likely to suffer from mental health issues in the weeks shortly before or after birth than at any other point in their lives. More than 20% of the 27,000 births in Cheshire and Merseyside each year involve some sort of mental health issue and these difficulties can have a long term impact on both mother and child if left untreated. This new funding will improve early intervention in perinatal mental health care to prevent local women and their children from experiencing potential problems in the future. Tania Stanway is a Consultant Psychiatrist at Cheshire and Wirral Partnership NHS Foundation Trust (CWP) and is Chair of the Northwest Coast Perinatal Mental Health Clinical Network. She said:- "Mental health problems are the second leading cause of death amongst women in the perinatal period, and they have long term effects on women, their children and the wider family. I'm delighted that this is being recognised nationally as an important issue. This funding is fantastic because it will result in improved care and mental health support for thousands of women during this critical time in their lives. We have spent the last couple of years working towards improved perinatal care within our region and so feel ahead of the curve at the time of this important backing from NHS England." Cheshire and Merseyside is one of 44 areas (or 'footprints') across England that have come together as healthcare systems to develop Sustainability and Transformation Plans (STPs). STPs represent a change in the way the NHS and its partners plan services; with a stronger emphasis on collaboration. All 3 of the NHS Foundation Trusts have committed to the transformation of mental health services in Cheshire and Merseyside, which is being led by CWP Chief Executive Sheena Cumiskey:- "As partners in the Cheshire and Merseyside STP we aim to develop greater collaborative working so that we can deliver consistent, high quality care across the region. This bid for new funding for perinatal mental health community services is the 1st successful mental health bid for the STP footprint and we are delighted that women will be able to access services across the whole of Cheshire and Merseyside. Additional funding is expected to become available nationally to support mental health transformation and we will continue to work collaboratively across the STP to access this and deliver improvements for our population." Nicola Allen, Head of the Medical Directorate for NHS England Cheshire and Merseyside added:- "This is good news for Cheshire and Merseyside. A priority is to improve the community services available for new and expectant mums. We know that the team at Cheshire and Wirral Partnership worked closely with the North West Coast Strategic Clinical Network to develop the bid. We believe this will put the region ahead of the curve, in terms of developing services that prevent women and their children experiencing mental health problems in the future." Thousands of women from across Cheshire and Merseyside will benefit from the additional funding. 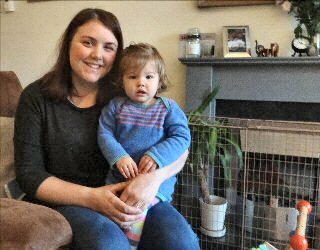 Rebecca Brook, a teacher from Macclesfield, was diagnosed with depression shortly after giving birth to daughter Eleanor last year. She said:- "I struggled to breastfeed when Eleanor was 1st born. This made me feel like I had failed as a mother, which led to strong feelings of depression and anxiety. I knew about the mental health risks to women during such a fragile time, but I never realised just how bad it makes people feel. I felt lonely and isolated. 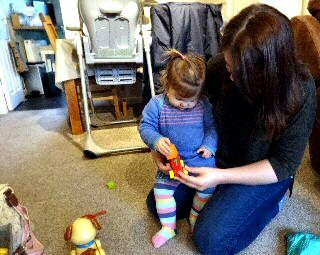 There were constant tears and even times when I even like running away because I thought Eleanor would be better off without me as her mum. I was lucky to have such fantastic support from my Health Visitor, as well as local mothering group, SMILE. However, I understand that some people aren't so lucky. The funding announcement is brilliant news as I'm sure it can really help to change stigma around perinatal mental health and provide consistent levels of support to local women." The perinatal development fund, set up by NHS England, is part of a �365m plan to expand perinatal support to an extra 30,000 women a year by 2020. A report from the London School of Economics showed that untreated perinatal mental health problems cost the UK �8 billion per year, and have an adverse effect on thousands of children. In response, the Government has committed to supporting services which help parents to bond with their children as part of the 'Future in Mind' campaign. Find out more about Future in Mind online.